Today's posting is more about a personal frustration than something that is strictly related to New York City. 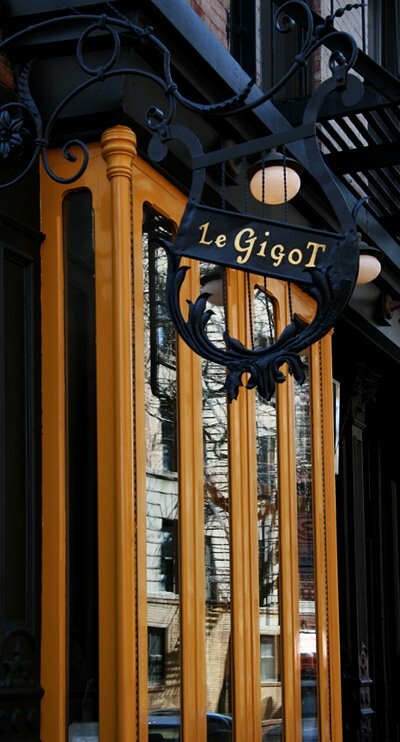 I have had this photo for quite some time - I always loved this small elegant sign hanging outside the fine tiny French restaurant, Le Gigot on Cornelia Street in the West Village. But how to use this photo? There really isn't anything about it which is particularly remarkable, but it is quite elegant. Ah, there's the source of my irritation - subtlety, nuance and understatement. I recall years ago have a conversation with an acquaintance regarding the perpetual debate regarding Apple vs. Windows based pcs. Ease of use, graphics or music professionals do not explain much of the large user base - there are plenty of scientists, business people, attorneys and computer geeks who use Apple. At one point I stated that many of the differences were due to nuances in the interface like subpixel font smoothing and that customers are willing to pay for that difference. My friend concurred and make the statement that subtlety and nuance were things all too underappreciated in this country. But nuance is the very thing that typically separates the ordinary from the finer things in life whether it is clothing, food, wine, cameras, furniture.